Calculating the value of points and miles is impossible. I’ve declared this before (Impossible point valuations and the joy of free) and no one has since convinced me otherwise. The argument boils down to this: the value you get from your points and miles depends upon how you use them. You may use your points for maximum value towards a dream vacation, or you may use points for minimal value by redeeming for items, such as that new microwave oven you’ve been eying. Or, maybe you won’t use your points at all… ever. With examples like these, points can be worth a lot, a little, or nothing at all. I received an offer from Club Carlson for 30,000 points after one stay. Is it worth it for me to check into a cheap Club Carlson hotel just to get the points? The Amex Hilton Surpass card has great category bonuses: 6X restaurants, gas stations, and supermarkets; 3X everywhere else. Should I use this card instead of my 2% cash back card? I’m about to buy a microwave oven from Sears. My favorite cash back portal is offering 5% cash back at Sears and the Marriott shopping portal is offering 8 bonus points per dollar. Which is better? Another way to estimate the value of points is to compare redemption point prices to actual cash prices. For example, if a hotel charges 10,000 points for a free night and the same hotel charges $200 cash per night, then we can say that redeeming points for a free night at that hotel will give us 2 cents per point value. Of course, that’s just a rough approximation since a reward stay may be less valuable since it doesn’t earn points and may not earn elite stay credits (depending upon the chain). On the other hand, a reward stay may be worth more since taxes aren’t usually included in award stays, and some chains do not charge evil resort fees for award stays. Also, many will quibble with the term “value” by saying that they personally wouldn’t value the particular hotel in our fictional example as highly as $200 per night. Maybe, for example, there are similar hotels in the area that charge only $125 per night. In that case, it may make sense to estimate value using the best available rate rather than a particular hotel’s rate. Fair enough, but I’m going to ignore that line of thinking for the rest of this analysis because I don’t have any such data and I’m the author — I can write what I want. Wow, I can get 4.38 cents per point value at the Hyatt Regency Suites Atlanta Northwest! Good stuff. Even better, for the purpose of this post is that Hotel Hustle has a page showing average point values gathered from real world searches like these. Fair Trading Prices can be considered estimates of the acquisition cost of points and miles. The Hotel Hustle data, meanwhile, can be considered estimates of redemption value. Some interesting results pop out of the above table. First, if it were possible to straight up buy points at Fair Trading Price values, you would get good value from most hotel chains, with Hilton and SPG as lone exceptions. Second, Hyatt is awesome. If you could buy Hyatt points at the current (August 12 2015) Fair Trading Price of 1.11 cents each, you have an excellent chance of getting very large savings. If you could run out and buy hotel points at the Fair Trading Price rates, the above tables would show you which chains are worth investing in. Unfortunately, you can’t. Sometimes, though, there are sales on points (via Daily Getaways, for example). In those cases, you could do as I did above and compare the point purchase price to the Hotel Hustle Averages to see if those points are a good deal. The tables above can also help inform point earning through paid hotel stays. If you’re planning paid hotel stays (for work, maybe? ), points earned from Hyatt stays are more likely to result in big future savings than, for example, points earned from Starwood stays… all else being equal. The Fair Trading Prices specifically for Hilton and SPG are calculated by comparing the point earnings available through credit cards (Amex SPG card and Amex Hilton Surpass card) to a no-fee 2% cash back card. The charts above suggest that you would have to cherry pick the best hotel redemption options to do better with those credit cards than with a 2% cash back card. In other words, for hotel stays, putting spend on a 2% cash back card will likely get you more hotel night value than the same amount of spend on the SPG or Hilton cards. 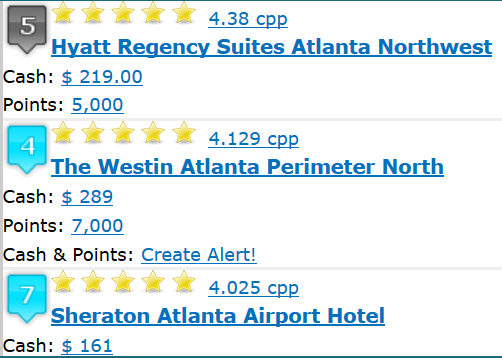 Confusingly, the tables above do not mean that Hyatt points are worth more than SPG points. Not at all! SPG points are much harder to acquire so they have a higher Fair Trading Price. If you can get SPG points cheaply, then do it. However, buying them at the current Fair Trading Price of 2.16 cents each is probably not a good idea. I started this post with the assertion that calculating the value of points is impossible, but then went ahead and introduced two options for estimating point values. It’s often important to have a rough idea of what points are worth, so I believe that it’s worth trying to estimate these values even if it’s impossible to get it 100% right. You need to know which portal to use, whether it’s worth going out of your way to accumulate additional points, which credit cards give the best rewards, and whether to use points or cash for a stay (or a flight). So, which metric should you use? Fair Trading Prices or Hotel Hustle values? My approach is to use Fair Trading Prices anytime I’m concerned with acquiring points: when choosing a shopping portal, for example. I would use Hotel Hustle values to estimate how much value I should get from my points. When using points for a hotel stay, for example, my goal would be to get better value per point than the median Hotel Hustle value. Interesting post. So would you say then that transferring UR points to Hyatt was a good use of UR points? I am confused about Fair Trading Prices. Doesn’t you final chart show the the FTP for Hyatt should be adjusted higher and Starwood lower? That is often my strategy, especially because I can consistently generate 2 – 5 URs/$ with everyday spending for personal and business. I include how easily I can generate points in the value equation. When I lived in New England, buying $500 Visa GCs to load to a “Bird” at a grocery store was easy. In Pittsburgh, not so much. CVS is pretty much my only option. Not as many cards give bonus points for drug stores as they do for grocery. Thankfully, Staples and Office Depot are close by for 5x URs. So URs are a primary strategy for me. However, sometimes you don’t care so much about it because you want the location *sigh*. Much better is the IC Thalasso OWB in Bora Bora for 1.8 cpp in Jan 2016 that we have 8 days at. Much worse is the Moorea Hilton at 0.5 cpp that we have several days at. Great stuff on highlighting the Hotel Hustle median values as a good benchmark for redemption value at hotels. Personally, I discount those by 50-60% due to consistent availability of high quality alternatives that I would pay cash for instead, such as Priceline/Hotwire 4 or 5 stars, or quality Airbnb accomodations. And my prior redemption calculations do seem to line up with Hotel Hustle x 60% discount using the Priceline/Hotwire/Airbnb benchmarks. On a somewhat related note, I miss your Reasonable Redemption Value framework! Any updates on extending that concept to additional flyer programs, and adding more metrics for customized adjustment (Stopovers, availability factors, etc)? As you mentioned in the opening and a fact I advocate is points and miles have no value until you redeem them for something. Bottom line is how you choose to use points. One of my main rules when it comes to valuing hotel points is be better than average. Your table and hotel hustle show Wyndham Rewards points $55 per 10,000 points. Any Wyndham brand hotel worldwide is 15,000 points for a free night. Your valuation gives a Wyndham free night as an $82.50 value. Last month I redeemed 15,000 Wyndham Rewards points for a $342 hotel night in Boston. That is more than 2 cents per Wyndham Rewards point and about 4x the value shown for Fair Trading Price or Hotel Hustle median. Someone searching for a $100 hotel room night at 15,000 Wyndham Rewards points pulls the median value down. Back to my rule – redeem points to be better than average. In June, I saved $100 redeeming $55 + 3000 Wyndham Rewards points for a Days Inn stay in Asheville, North Carolina. I paid $61 + 3,000 points for a room night priced at $144 after tax. Those 3,000 points were worth 2.7 cents each in dollar savings on a room night – more than 5x fair trade value. The following night I stayed at Ramada Asheville for $100 and earned 4,000 Wyndham Rewards points. In the end, I paid $161 for two room nights with a net gain of 1,000 Wyndham Rewards points for rooms priced at $244 for the two nights. 2,000 Wyndham Rewards points saved $83. That is a far higher redemption value than $11, which is the fair trade piece you show for Wyndham Rewards points. My hotel points redemption rule – Be better than average. IHG Rewards Club – I redeemed 75,000 points for 9 hotel nights next month in Czech Republic, France and Switzerland. Room rates are $1,200 for those nine nights. There are many poor value hotel reward redemptions that can be made with IHG points. I am getting about 1.6 cents per point or 3x your fair trade value. I can buy 100,000 IHG points today for $575 during their current sale. That is slightly above fair trade value of 0.55/point shown in your table. Choice Privileges – This summer I redeemed over 130,000 Choice Privileges points for 8 hotel nights in Florida, Boston and Copenhagen. Room rates were $1,600 for those room nights. That is 1.2 cents per point and double fair trade value. I purchased 172,000 points in Daily Getaways in April 2015 at rate of 0.42/point and redeemed for 1.2 cents within 90 days of my purchase. Even better value was 13 nights in Norway in Sep 2014 using 216,000 Choice Privileges points. Published low rates for those room nights was over $5,000. Oslo and Bergen were ranked at or near the world’s most expensive places to visit in Sep 2014. Redemption value = 2.31 cents/point. My rule is be better than average in hotel redemptions. These are just three examples of hotel points value from the past year. I have been getting this kind of value from hotel loyalty program points for the past 16 years. I used to estimate hotel points value. Now I look at the issue differently. I evaluate each opportunity to earn hotel points with the potential redemption value I see for hotels around the world. I balance earning and redemption of hotel points throughout the year with my hotel stays. to earn when promotions are good and rates are low and redeem when promotions are poor and/or hotel rates are high where I am traveling. As a leisure travel, I can balance paid hotel nights and redemptions to keep costs down and stay in hotels 70 or 80 nights per year, typically for around $60 per night average. You seem to ignore that using a Citi Hilton Reserve card gives 10x points and the Hilton surpass card gives 13x points plus being a Diamond member gives double or triple points for the stay changing the whole equation. Do yourself a huge favor and dont pay for hotel stays anymore unless the stay is paid for by your corporation. Spending real money on hotel rooms is a foolish endevour. The weird thing about Marriott is I could only obtain points via UR, and that’s nearly universally a terrible idea. You are wasting a lot of money when staying or MSing at chain hotels for leisure. Valuations obtained from the hotel’s own websites are grossly inflated even though they are discounted from BAR and factoring in the hotel points. Many corporate customers have much deeper discounts. If you don’t have the right to use a good corporate discount code, you can use airbnb or priceline to get a comparable quality stay for far cheaper than the best non-opaque rate. Once you airbnb and priceline enough, you will find that you can do it in popular places like Maui. $175 all-in except for resort fee/parking for 5 stars, sign me up. Hotel hustle x 60% sounds OK to me as well. This means your points are worth far less than what you think they’re worth. MS for hotel points is really bad. Opportunity cost is high vs. cash and airline miles. Only MS hotels when you have MS the max possible for cash and airline miles. The only time to pay for a non-opaque hotel stay is when your employer is paying for it. Because of airbnb and priceline, you are not really doing better when choosing a hotel redemption that has a ridiculous cash cost. If you want to delude yourself that you got a good deal when the cash cost at a specific chain hotel is $1000/night, I have a book about Santa Claus and the tooth fairy you can read. When I stay at the Intercontinental Bora Bora Thalasso in January in an over water bungalo that I booked with IHG points that I MSed, I will remember that I could have used airbnb to stay in a shared residence on Bora Bora instead of that OWB. When I stay in the Hilton Moorea Diamond OWB with free breakfast buffet I will keep that in mind. Your point is well taken but is definitely not completely universal especially at remote aspirational locations. Fred, do you a lot of experience with Priceline in international cities? Tokyo, Bali, Mumbai, Paris? I’ve never used it much. I compare the amount of points it takes to obtain a $25 or $50 gift card when comparing points obtained from a hotel to get an idea of their value.